Did you know your fish are “cold blooded”? 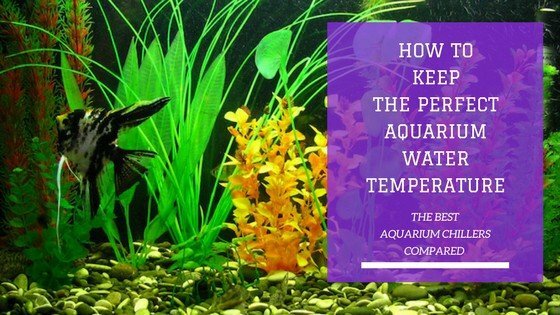 This means your fish body temperature is not constant but varies according to the temperature of the environment they live in, that is the water of the your aquarium. This is why controlling the temperature of the water is essential for the health of your fish and invertebrates. Generally speaking an ideal, recommended range is at approximately 76 to 80 degrees Fahrenheit. 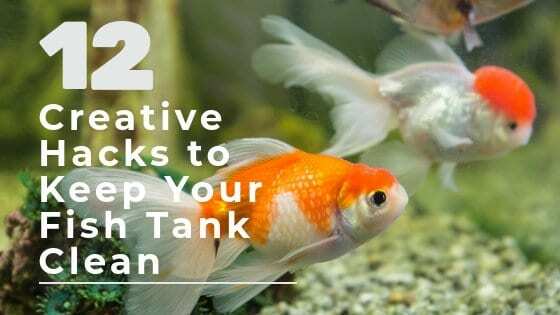 This is a general range suitable to many species, though some kinds of fish will require water that is several degrees warmer or cooler, so you need to adjust it to the fish you have in the tank. Controlling the temperature of your tank’s water is possible through two pieces of equipment: a heater and a chiller. 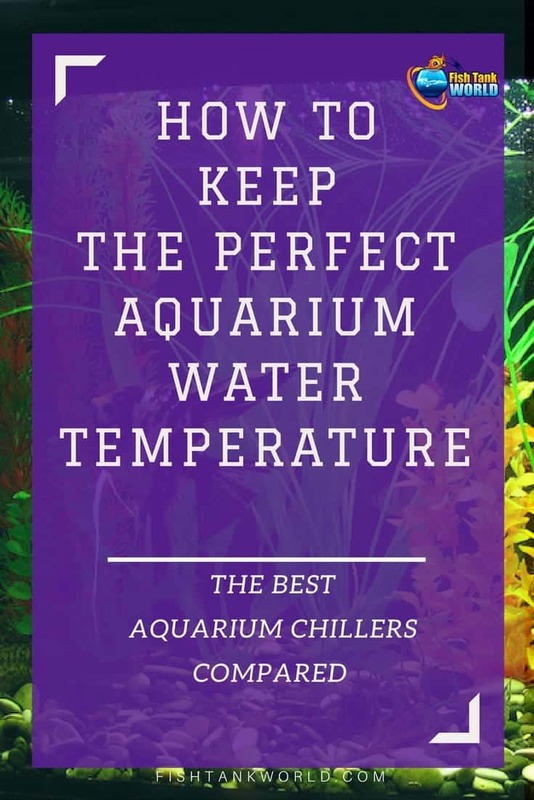 In this article we will focus on the chillers to make sure we provide you the most up to date information to choose one of the best aquarium chillers on the market. What exactly is an Aquarium Chiller? How does an aquarium chiller work? IceProbe Thermoelectric Aquarium Chiller - 4 in. x 4 3/4 in. x 7 1/2 in. An aquarium chiller is a piece of equipment that is used to cool the tank's water, keeping it at a pre-determined temperature and unaffected by external influences, such as sunlight or artificial heat generated by central heating systems. Whereas some species of fish, such as tropical fish for example, require a heater to keep the water warm, other species require a chiller instead. Bass and trout are two examples of fish that require cooler water temperatures. Sometimes, the chiller is a small refrigeration unit that is installed alongside your tank’s filtration system, and acts by cooling the water as it flows through the system. Paired with a thermostat, the chiller can control the water’s temperature by preventing it from rising over a set level. In other cases, the chiller may simply be an external fan that blows directly onto the surface of water. The latter chillers are typically less expensive, but the trade-off is usually a unit that is less efficient. Finally, there are also probe based chillers, in which a probe sits directly in the body of water. These are typically built from high-quality components, but suitable for tanks of a small capacity only. As mentioned above, there can be two distinct types of chillers. The fan-based units are simple and work by directing cool air onto the surface of the aquarium’s water; however, the refrigeration units are more complex. Most of these utilize a vapor-compression process to reduce water temperature, which can be complicated to understand, but doing so means you’ll be in a better position to maintain the piece of equipment and identify any problems that may occur with the unit. Water from the tank gets pumped through the chiller, first passing through the heat exchange. This component directs the flow of water between many chilled, metal coils that are flooded with coolant. The transfer of heat then takes place from the tank water to the coolant fluid. Once the coolant has been warmed by the transfer of heat from the aquarium water, it is compressed into a gaseous form within the compressor. This, of course, creates pressure, which is responsible for the movement of coolant through the chiller’s cooling system. At this stage, the coolant in its gas form is pressurized and transferred into another component called the condenser, where a fan directs chilled air onto the component, reducing the temperature of the coolant once more, and causing the heat build-up to dissipate into the surrounding atmosphere. As a result, it’s essential that there is plenty of ventilation space around the chiller. The above process results in the temperature of the coolant coming back down, at which point the gas transforms back into a liquid, and the cycle can continue. The coolant finally flows through another component known as the expansion valve, where pressure is eased and control over tank water temperature is exercised. A temperature control can be installed within this system, though rarely comes as standard with most chiller equipment. Here we’ve put together a list of some useful tips to help you make the most of your aquarium chiller. Chillers can vary in their form and function. Be sure to select a water pump that is not only compatible with your chosen chiller, but that also has a sufficient flow rate to support your chiller’s requirements. Pumps are typically not included with chillers so ensure you check whether you need to purchase one. Most chillers need adequate space for ventilation, so that the accumulation of heat can dissipate into the surrounding air. In most cases, with the exception of fan-based designs, the heat dissipation will occur around the output fan, so ensure that there is plenty of space for this component to ‘breathe’. Though many aquarists choose to hide equipment away under aquarium stands, it’s best not to contain them within cramped cabinets. It’s essential that your chiller is only allowed to operate wet, as was intended. Running the machine dry can result in damage to integral components, so don’t be tempted to do this, even during maintenance periods. Replacing components can often be as expensive as buying an entirely new product. As with any regular, desk-based fan, your aquarium chiller’s fan can become clogged with dust, as can the condenser component. Regularly cleaning both can result in more efficient air flow and thus better temperature control. Just like heaters, filters and your tank lighting system, chillers require power to operate. Make sure that you take this into account when setting up aquarium equipment, but don’t overload sockets or adapter cables when hooking up yet another machine to your aquarium system. Your chiller stands a better chance of a long lifespan when the correct size is purchased for your tank – pay attention to the capacity limitations advertised with most models. When installed with a temperature controller, chillers should ideally run for no longer than 20 to 30 minutes at a time. Now that you know a lot about aquarium chillers, it is time to check out the list of some of the best chillers currently available that we have picked for you. This list includes both cheaper fan-based units, and the more expensive – but more efficient – refrigeration units. Running an aquarium can rack up energy bills once factoring in the operating power required to run a heater, chiller, lighting and pump system. If you’re looking for an aquarium chiller that has low energy consumption to take the edge off your bills, then the ISTA Aquarium Arrayed Cooling Fan is a good pick. This fan-based chiller also comes in a range of sizes to suit fish tanks of varying dimensions, connecting a series of fans together to increase the cooling capacity, though this is at additional cost. Cooling efficiency is not as good as probe-based chillers that sit within the aquarium’s water, with the simplistic, fan-based design being mounted on a pivot that is designed to clip onto the tank’s glass panes. However, this design does allow for easy positioning, giving you full coverage of the surface of the body of water. The ISTA Fan is built from lower-quality, plastic components, unlike some competing products that use corrosion-resistant aluminum allots, though this helps to keep the price down somewhat. The ISTA Aquarium Arrayed Cooling Fan is one of those models that falls into the fan-based category, as opposed to being a full refrigeration unit. This makes it generally less efficient than a dedicated refrigerator chilling system, though it can be scaled up with additional fans, meaning it can support tanks of varied capacity. With a simplistic design to boot, it will be sufficient for anybody looking for a cheap chiller, whose aquarium only sees minor fluctuations in temperature that do not require a great deal of exertion to bring under control. Whereas many aquarium tank chillers are external fans that blow directly onto the surface of the water, the IceProbe Thermoelectric Chiller has a probe that sits directly in the body of the tank’s water. This allows for greater efficiency in heat transfer, meaning it’s capable of reducing the tank temperature more quickly. The whole of the unit can be positioned within the tank, or on the exterior if a hole can be created within a glass pane. This chiller is best for smaller aquariums, recommended for tanks of up to 20-gallon capacity only. However, it is energy and space-efficient, making it easy to stow away under an aquarium stand, and runs near-silently, whilst remaining cool throughout operation. The main drawback is that no ‘On’/’Off’ switch is included within the design, meaning that the AC power must be entirely shut off in order to stop the chiller from operating. The IceProbe Thermoelectric Chiller is somewhere between the cheaper, fan-based chillers and the more expensive refrigeration units, with a probe that is immersed within the aquarium tank for direct contact with the tank’s water. Though more effective than chillers that rely solely on a fan system, the IceProbe is typically only suitable for smaller aquarium tanks. The main drawback is in the lack of a power switch; since you’re not supposed to run chillers for long periods of time, the need to routinely disconnect the mains power could become tedious quickly. The Active Aqua Chiller is relatively inexpensive compared to other large, refrigerator units that you can purchase for your aquarium. Despite this, it still has a range of functionality enjoyed by similar chillers, such as a microcomputer control system and an LCD that is clearly visible night and day. The chiller has a large refrigeration capacity, being capable of supporting tanks up to 105 gallons, and can approximately 40 gallons of water by around 15 degrees Fahrenheit in around 20 hours. Despite its large refrigeration capacity, the Active Aqua Chiller commands only a small footprint within the home, with a basic white design that will blend into the background amongst your other aquarium kit. Its only real downsides are that there is no water pump supplied with the product, as well as a temperature gauge that can fall slightly out by a degree or two of accuracy. Though this chiller can sometimes suffer from slight variations of accuracy in its temperature readings, you’re getting a unit that supports a very large capacity of up to 105 gallons. It also has a tendency to give off quite a bit of heat, though this can easily be countered by providing sufficient ventilation space around the unit, especially when you consider the small footprint that this chiller commands. This model is a good entry-level price if you’re seeking a refrigeration chiller, and what’s more, it is the smallest brother to a number of other, larger tanks. The JBJ Arctica Titanium Chiller is often considered one of the best currently on the market, supporting a wide variety of tanks of varied capacities. It is also marketed as being the quietest chiller available on the market. Though a hose is not included with the chiller, one can be picked up separately, and installation is reportedly very easy. In terms of functionality, it has a smart memory chip built-in, which restores the chiller to its last known temperature in case of a power cut or shutdown. Your tank’s temperature will typically be optimized for your species of fish, so this is a much-appreciated feature. Additionally, a digital LED temperature controller displays the current operating temperature, which is easily read in light or darkness, meaning it’s always clear if something isn’t quite right with the temperature of the water. With a reputation for being one of the best aquarium chillers on the market, you can’t go wrong with the JBJ Titanium Chiller. It’s quiet during operation, easy to install, and capable of cooling water temperature very rapidly. What’s more, it’s highly energy efficient. With all of these positive qualities, it is worth mentioning that it’s not always immediately responsive to water temperature changes, but this causes no major problems with temperature maintenance in the long term. The ColdWind cooling fan features two individual blower fans that can be pivoted into the desired position, independent of one another. An aluminum alloy construction ensures that the product is not only strong and durable, but also resistant to corrosion from moisture given off by the aquarium tank. In terms of tank capacity, the 50 – 80 cm design is suited for tanks of up to 20 gallons, though a larger unit is available, too, for tanks of double the size. Attaching the chiller to your aquarium is simple; the aluminum clip securely fastens the fans to the upper rim of any of the aquarium’s glass panels, though some maneuvering may be required to ensure that it doesn’t interfere with your aquarium hood. If you’ve got an aquarium up to 20 gallons capacity, then this fan is the perfect option whilst still being cheap. However, for larger tanks, you may want to look elsewhere, or consider upgrading to one of the larger ColdWind models. Another member of the fan-based family, the ColdWind is another chiller that can be scaled to suit the size of the aquarium tank using a series of interconnected fans that direct cold air directly onto the surface of the water. As well as being simple in design and very inexpensive as far as chillers go. It is also constructed from aluminum alloy, which protects it from corrosion when exposed to the constant moisture of water evaporation. This makes it better overall than cheaper, plastic-based designs that offer less corrosion resistance when exposed to moisture. The two most common types of chiller available for both salt and freshwater aquariums are fan based systems, at the more inexpensive range of the market, and refrigeration units, typically more expensive, but also more powerful. Given the stark difference in functionality between the two different types of model, the clear frontrunner in terms of value for money is a refrigeration unit. However, a third type is available, known as a probe based chiller; the IceProbe product listed above is a good example of one such unit that is ideal for smaller aquarium tanks. Maintaining a homeostatic water temperature is not the only key step in keeping your fish healthy. 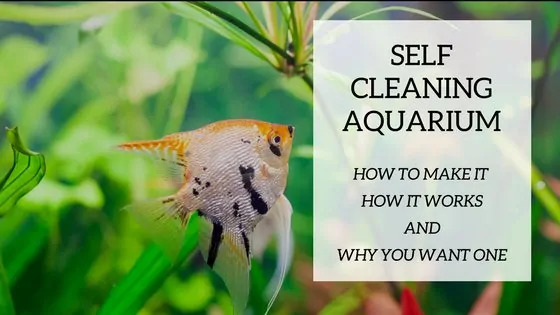 It’s also equally important to maintain a clean environment, with a reliable water filtration system, secure spaces for vulnerable fish to hide, minimal algae growth and species that are compatible with one another. 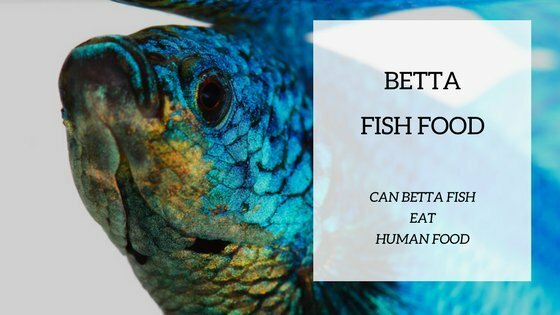 This will give your aquarium fish the best chance of survival and health.